Ultra Light Spin Rods and Increasing in Size Up to 30lb Tarpon and Shark Spin Rods. Fly Tackle - 6wt Rod Thru 12wt Rod Available in Left Hand Retrieve or Right Hand Retrieve. Captain Lenny Leonard is the owner and operator of The Bone Fish, which has been labeled as one of the best Charters in all of Key West. In the Key West area, there are hundreds of guides, who are willing to offer charters to tourists. However, the locals are well aware that truly good guides are hard to come by. Captain Lenny Leonard is not like any other guide in the area. In fact, Captain Lenny is the cream of the crop. When choosing Captain Lenny you can be secure in knowing that you have chosen a guide that knows the Key West waters like the back of his hand. Since the days when he was a child, he has been out fishing these waters and today it is his full-time job. With a history like his, it is no wonder why Captain Lenny is able to offer a well-organized, enjoyable, and educational fishing charter. 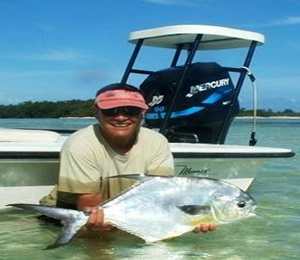 With Captain Lenny you will have the opportunity to fish the Flats around the Key West area. Your tour might involve fishing in the Marquesas or you might head down towards the Lower Florida Keys. You will have a shot at battling ocean predators, fly fishing, and attempting many other fishing styles. If this sounds interesting to you then you will not want to miss this charter. You will experience a number of fishing options that will appeal to both the seasoned angler and the brand new yet interested fisherman. Captain Lenny is here to offer you as much training as you need. Being patient by nature, he takes everything in stride and as he offers you your training you can expect it done with a smile. Do not worry about how much training you need, the Captain is well aware that all people learn differently and that some will need more help than others. Help and advice is given as if it were second nature. All questions are answered until you are satisfied and you understand what you need to know. All instruction is handled for both traditional and fly fishing styles to ensure you are ready to use the equipment that Captain Lenny provides to you at no additional charge. The customized flats skiff on Captain Lenny’s boat, the Bone Fish, is suitable and easy to use for both new anglers and experienced anglers. The beginner level fisherman will be thankful for the stability of the skiff while the experienced fisherman will love the pleasing and stable fishing environment. The charters offered by Captain Lenny provide all you need to enjoy your fishing trip the right way. Captain Lenny is both licensed and fully insured. In order to provide the best possible trip, Captain Lenny recommends you bring a few things on your trip. It is recommended you bring a hat, sunscreen, polarized sunglasses, and any food or drink you might want during the trip. Fly tackle - 6wt rod thru 12wt rod available in left hand retrieve or right hand retrieve or both. I have been to the Bahamas many times, but The Bonefish is one of my favorite trips! It includes everything that everyone should do here. As a Bahamas veteran, I can say only the best about this experience!